The upland goose or Magellan Goose is a sheldgoose of the shelduck-sheldgoose subfamily This bird is indigenous to the southern part of South America. 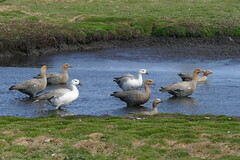 The ruddy-headed goose breeds on open grassy plains in Tierra del Fuego, Chile and the Falkland Islands. The South American birds are now very rare.